These are original drawings done by hand in india ink published in Dungeon Crawl Classics including some from Citadel of the Demon Prince, The Sunken Ziggurat, Lost Arrows of Artisimus and The Stormbringer Juggernaut. The image at right is in the store (until some lucky bugger snaps it up) and is one of my favorites. 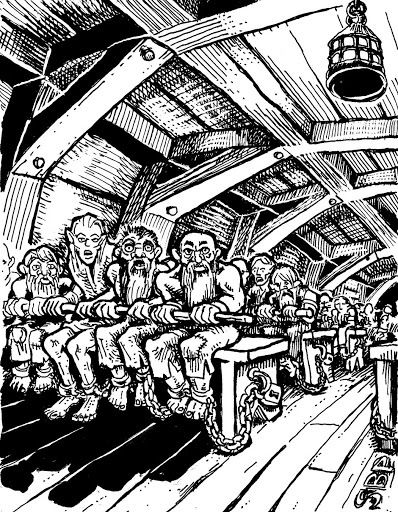 That is an image of enslaved humans, dwarves, etc., all chained to their oars in “The Stormbringer Juggernaut” adventure from a few years ago. I originally hoped to keep all of these for my own collection, but (reluctantly) have decided to sell them because I need the money. I’ll be adding more artworks as I scan them, catalog them, etc., so please stay tuned. I’ll be adding some color work in the future.